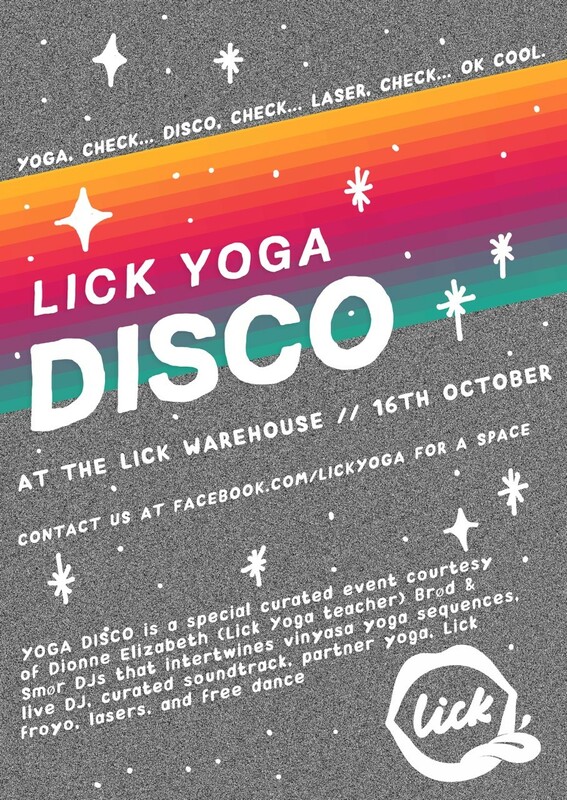 We are still enjoying the glitter remnants from our last one, so we´re doing it again with another Yoga Disco at the Lick Warehouse! Location: The Lick Warehouse, New England House, Brighton. Map is below- come in on the side “lower” entrance of New England House by the graffiti (floor 2). Here´s a link to a video from our last Yoga Disco at Lick! Q: I thought yoga was about silence and meditation, not noise and God forbid, “disco”?! A: Your yoga is your yoga. While for some, silence is imperative, others might prefer sound. And this might also change depending on your mood, hey, we´re highly complex beings! There aren´t rules for what yoga “is” as it´s an individual experience. You can find your yoga in any thing, place and situation, so should life be throwing you tranquility and solitude or a noisy dog barking/baby howling, your yoga provides an opportunity to go inward to your own centre, silent or otherwise. Just as a creative sequence might provide an opportunity to explore postures/ your body/state of mind in a new way, so does the element of sound. That´s where Nāda Yoga (the yoga of sound) enters the arena: It sees the primary stuff of the universe as vibrationary and thus sonic. As music can affect our moods and minds in different ways, and using rhythmic varieties, melodies and varieties, combined with asana and physical movement, think of this as an internal /external sonic exploration, if you will. Q: Does that mean that awful cheesy disco music. Q: But how will I know what to do? A: The volume is adjustable of course, but the sequence will also be demoed. If you´ve never been to a yoga class before, you might find placing yourself nearer to the back of the room is helpful, so you can also see more of what´s going on. Q But you have music in your classes anyway, so what´s different about this? A: Good point, soundtracks are curated along with the theme and sequence for every class, but this will be slightly different. It is a yoga class, for sure. A sequence practiced to music. And dance – free dance! Don´t be scared, it´s fun! There will be a DJ “spinning the hits”, lights (including lasers), and a definite party atmosphere. To shake it up a little, lick yogurt will be served for your post-class-pleasure. Think “party”. A celebration, a liberation and most importantly, FUN! Q: OK, i´m curious. I´ll come along. I don´t have one of those mattress things though. And what the hell should I wear? A: No problem. There are mats for you to borrow (but numbers are limited, so email yoga@lickyogurt.com to reserve asap). And wear something you can move in. Interpret that how you like, and fancy dress (sequins, lame, capes etc.) are welcomed and encouraged. We practice barefoot (but post class feel free to bring on the platforms). Q: But what if i need to lurk around to understand a bit more about what you do first? A: Ok, you can check out our Yoga Disco page here, or join us on the Yoga with Dionne or Lick Yoga Facebook pages. You can find some other nibbles on Tumblr and elsewhere on social media (see top right on this page), but feel welcome to experience us in real life! This entry was posted in film, news, schedule, workshops & events, Yoga Disco and tagged Brighton, brighton yoga, lick yoga, Lick yogurt, new england house, visit brighton, yoga class Brighton, Yoga Disco. Bookmark the permalink.